Mobile GMail: Where art thou? : Is There A Problem Here? : Mobile GMail: Where art thou? Mobile GMail: Where art thou? There seems to be a problem with mobile GMail. I don't know what 0x8007054f means but it doesn't seem to be a good thing. I can't get to my email. Windows Mobile won't let me select and copy text from a dialog. 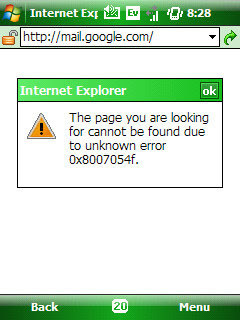 I'm going to have to try to remember this number in order to search for the error code. 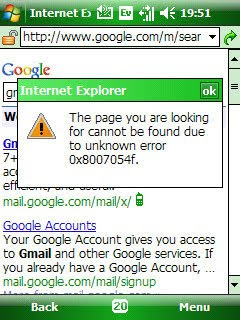 A Google search for the code reveals a bunch of results about errors installing Windows XP updates. No help there. I'll have to wait and read email when I can get to a computer. I am still getting the error 10 hours later. Some times I get the above instead of the error 0x8007054f dialog. I can access other web sites, so I don't think it is a problem with my wireless carrier. Googling for Gmail and clicking a link in the results gives the same error. 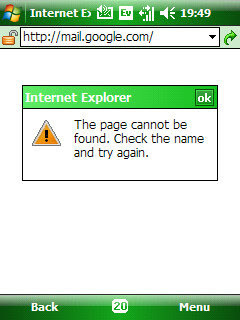 I try a different browser. 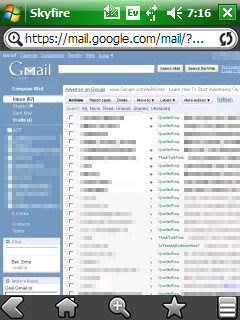 SkyFire can access the full-featured Gmail. However, continually zooming and panning to read and write email on the tiny phone screen is going to be cumbersome. 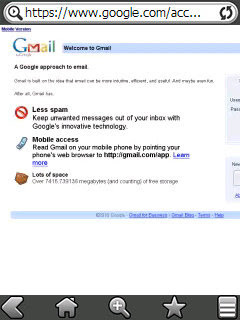 I want my mobile Gmail back.